Fortunately, I discovered the “Mom, Can I Help Around the House” system by Janet Nusbaum which is a “simple, step-by step system for teaching your children life-long skills for pitching in and picking up.” Since my three children are still young, ages 3, 4 and 5 I thought that this was a perfect opportunity to take control over my household and learn different techniques for setting up a chore system. All of my children to varying degrees have always been willing to pitch in and I realized that this was my opportunity to put an actual system into place to encourage their efforts and willingness to help. Once I started reading the manual, I devoured it. “Mom, Can I Help Around the House” is so straightforward and addresses real life challenges that we all face in managing our homes. I loved the section that discussed that every child is unique and has a different learning style. I also liked that the manual provided age appropriate ideas and ways for your child to help around the house. For example, my three children will walk in the house and just throw off their shoes. No matter how many pairs of shoes that they have they can never seem to find a pair when it is needed. Instead of having the shoe buckets in the closet (was not working), I found a pretty basket that I put at the entrance to their room. When they take their shoes off the children know that it goes directly into the basket. It has taken several reminders but after about a week, I have noticed that the shoes are put where it belongs without reminders. 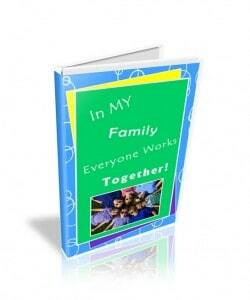 The worksheets in the manual were another excellent way to individualize the program for our families needs. As a social worker, I appreciated the section on using positive reinforcement instead of “bribery” or coercion. This technique is very effective and really does promote the self esteem of our children. Also included was the “In My Family Everyone Works Together” chore system binder which allows you to select and organize the tasks by time frame and chore frequency. I accept that I will never be “Supermom” but at least now I have the tools necessary to feel more relaxed and in control of my household. It has taken some of the stress out of my routine and allowed me to enjoy being a wife, mother and teacher again. Janet Nusbaum is a professional organizer and mother of two who developed this system after experiencing real life chaos in her own home. Not only was Janet’s system effective but it allowed her own daughters to be more self-sufficient and, confident and responsible. Total System is only $34.97. It is very affordable and well worth the investment in my opinion. liked the organizing genie on fb. like simply stacie on fb. I like The Couponizer – Coupon Organizing System.